There’s someone who has more incentive to win this weekend, though. It’s Ryan Fitzpatrick. The game at Buffalo will mark his first return to his former employer’s home—after being released three years ago—and a playoff appearance is at stake. Jets fans would of course salivate at those numbers, after an unending string of uneven performances at quarterback over the years. But Buffalo decided they wanted to start over at quarterback and so they selected E.J. Manuel in the first round of the 2013 NFL Draft. Three years later, Manuel is no longer the starter as the move hasn’t worked out for the Bills—who still haven’t been to the postseason since the turn of the century. Meanwhile, Fitzpatrick is on his third team in three years since his release. Though he faced his former Bills teammates last year as a member of the Texans, this will be the first time Fitzpatrick returns to Buffalo. On the line is not only revenge but also a spot in the postseason for the Jets, for the first time since 2010—and Fitzpatrick’s first time ever in the postseason. The veteran quarterback may be on his sixth team since entering the league in 2005 as a seventh-round selection of the St. Louis Rams, but he’s never had the weapons around him to show what he can really do. By the time he joined the Rams 10 years ago, St. Louis was in transition from being the “greatest show on turf” to missing the playoffs for 10 straight seasons—and counting. The Harvard grad then spent the next two years (2007–08) in Cincinnati—a time when the Bengals were in the midst of missing the playoffs 17 times in an 18-year span. After that it was a four-year run in Buffalo followed by a season with the hapless Titans (2013) and an audition with Houston last year. 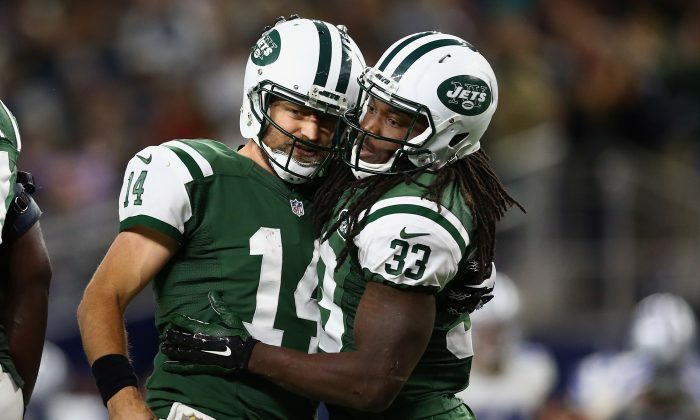 But with an adequate offensive line and a pair of Pro Bowl-caliber receivers in Brandon Marshall and Eric Decker, the Jets have surrounded Fitzpatrick with just enough talent to show what he can do under the right circumstances—leading a team to the playoffs. Although Larry Fitzgerald thinks Jerry Rice's career record of 1,549 receptions is unbreakable, there might be a few others ahead of it.